Sakai Community DocumentationSakai 11 - EnglishSakai 11 Administrator Guide UsersHow do I add a new account? Enter the user information and then save. Once all of the information has been entered, click Save Details to save the information and add the account. Note: User Ids must be unique. 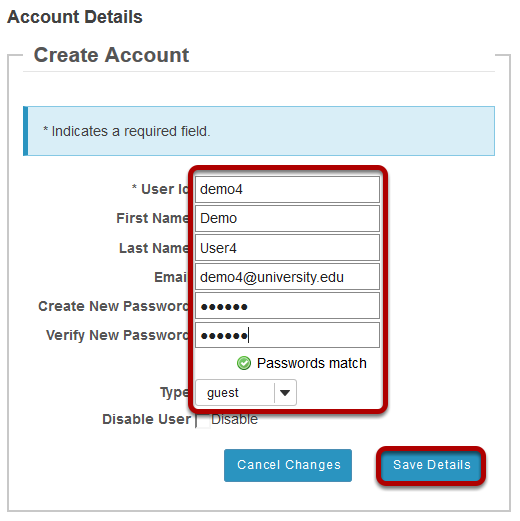 If you attempt to add a new user that has the same user id as an existing user, you will receive an error. Prev: What is the Users tool? Next: How do I create multiple new user accounts by importing a file?